Beech worktops offer a straight grain, for a smooth, sophisticated surface. you’ll be able to confidently choose the worktop that best suits your needs. Beech is a great material to work with and brings a real sense of style to a kitchen. Below are some of the main considerations you’ll face when making a purchase. What are the aesthetic properties of Beech worktops? Beech is a firm favourite among many customers as it’s such a versatile look and works well in so many environments. It’s light in colour, often with subtler hues of pink or brown running through the traditionally straight grain on standard worktops. Our rustic beech worktops have slightly more character in the grain for a slightly less uniform look. Depending on the veneer, it can be slightly darker or more golden in colour. Beech has a natural feel to it, making it a good fit for rustic designs and matched with neutral colours. What Beech worktops sizes are available? The standard Beech worktop comes in a length of 3m, while Rustic Beech is available in both 2m and 3m. Both come in 640mm and 900mm widths, meaning that you can tailor your purchase to the size of your workspace without too much hassle. In terms of thickness, Standard comes in 27mm, 40mm, and 60mm while Rustic comes in 27mm and 40mm. This means that you can choose the right dimensions for your design, whether it’s thick bold lines that stand out, or subtler lines giving a sleeker look to your kitchen. Our solid wood beech worktops come in two varieties, so you can choose the perfect grain pattern. What accessories can you get with your Beech worktop? edges available; if you’re looking for straighter cut effects, with defined lines then edges such as Square, Single Imperial, Dip Groove or Venetian would work well. If softer, elegant curves are what you desire then you can’t go far wrong with Single Round or Double Round, Bullnose or one of the Pencil Round designs. Other accessories available include return ends and cutouts that can really bring your whole design together. 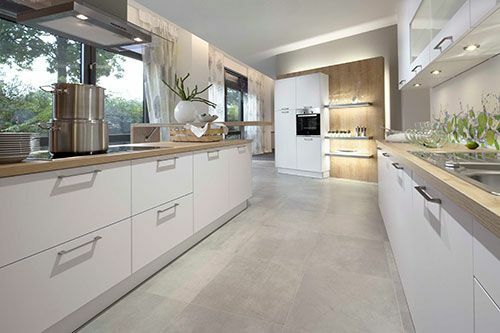 In terms of return ends, there are numerous designs available, all of which will be consistent with your worktop design. Whether it’s a Part/Full Return, an Angled Return, or a Breakfront Return for striking straight lines, or Single Radius, Double Radius or Curved for a softer and more curved design, you’re sure to find something you love. In terms of cutouts you have a similar choice to make, a Square or Single Bevel will be squarer, whilst Single Round or Single Pencil Round will be more curved. What are the benefits of choosing a Beech worktop? Beech is a classic style when it comes to hardwood. It’s suited to almost any kitchen style and can make a strong statement in terms of design choice. Beech worktops are durable and reliable, requiring very little maintenance. Beech can be sanded to renew the original look and lustre of the worktop. It’s a desirable material in kitchen design, so it can add to the value of your home. Beech is always a good choice for worktop surfaces and with a little know-how you’ll be well on your way to creating your dream kitchen. Shop our range of beech kitchen worktops now.